"I've always been a fan of Bob Dylan, Neil Young and Linda Ronstadt and in particular the drumming of Russ Kunkel (who was also rumoured to be the drummer on The Church's Under the Milky Way). Russ used Yamaha drums which peaked my interest - and it was cemented when I found out that Tony Thompson (Chic) also used Yamaha drums. I love the vintage look of my silver sparkle Absolute Hybrid Maple kit - it plays like a dream and has amazing hardware"
Steve Pinkerton is the enigmatic drummer with Dallas Crane one of Australia's most well-known rock bands. 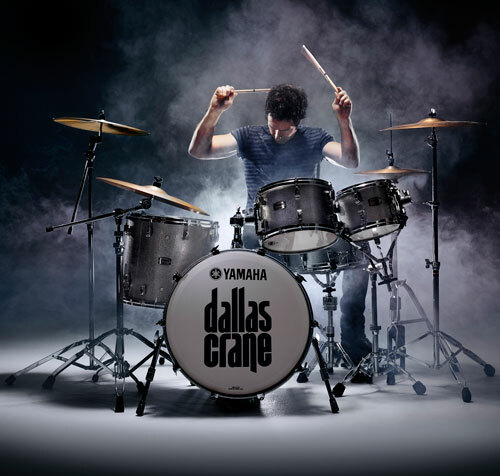 Dallas Crane's critically acclaimed third studio album, self-titled 'Dallas Crane', attracted three ARIA Award nominations, including Best Rock Album and the lead single 'Dirty Hearts' debuted in the Australian Top 40. They have become a formidable staple in the Australian live rock scene, spending 2009 touring Australia with The Who on their national stadium tour. Dallas Crane recently had 4 tracks featured on the Good Times: Celebrating 50 Years of Albert Productions (Deluxe Edition) alongside AC/DC, The Easybeats and Rose Tattoo. The band's latest album Scoundrels is due for release late November 2015 and will be followed by an extensive Australian tour. Steve was previously the drummer, lead vocalist and song writer with The Anyones who had both Australian and US record contracts and toured extensively across the States with Jet and The Killers among others, receiving American radio and TV attention. They shared the same management as Temper Trap and Gotye. Their album Lonerider was nominated for an ARIA Award for Best Rock Album. Steve has continued his lead vocals with The Ronson Hangup whose other members include Dave Mudie (drummer with Courtney Barnett) and Ashley Naylor (guitarist with Paul Kelly, Dan Sultan, Even). The band has enjoyed Triple J rotation and is currently finalising its 2nd album.